Share "How Long Should Pets Be Outdoors In Winter"
Many pets love to be outdoors, but the cold, wet, windy conditions of winter can be dangerous, even fatal if pets are kept outside too long. By understanding the hazards of winter weather and how long to stay outside safely, however, every pet owner can help their cats and dogs enjoy time outside without unmanageable risk. Even on a sunny winter day that may seem mild and balmy in comparison to blizzards or ice storms, there are risks for pets that may be out too long. If a pet is exposed to wintery conditions, they are at risk for hypothermia and frostbite. Sharp bits of ice can cause cuts that may become infected, while ice can build up on a pet's fur and cause them to get even colder. Cracked, chapped paws can also get infected and may lead to lameness or more severe illnesses, or pets could pick up toxic salts, de-icers or antifreeze compounds on their paws and fur, which can be poisonous if ingested as the pet grooms itself. 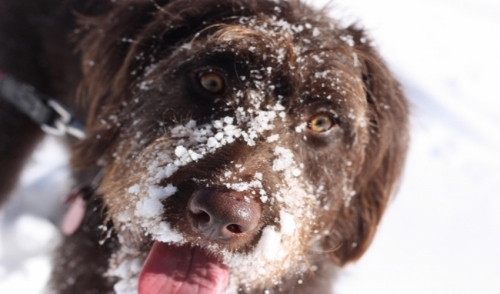 Some pets can tolerate being outdoors in cold conditions better than others. While each pet's tolerance levels will vary, in general larger, more robust pets can better hold their body heat, and pets with thicker fur coats are better equipped to deal with winter weather and colder temperatures. Pets that may be pregnant, very young, very old or that suffer from other health conditions are more fragile and should not be exposed to winter weather for any long periods. Pets that are more active – such as taking a brisk walk or playing a rousing game – can stay outdoors for longer before coming overly chilled, and if the pet is in a sheltered location, it may also be able to be outdoors for longer periods. There are no hard and fast rules for how long pets should stay outdoors in winter, though no pets should be left outdoors all the time when winter is at its worst. Pet owners should carefully supervise their pets when they are outside, watching for signs of discomfort. When the pet is shivering, trying to burrow into shelter or acting anxious and upset, they are too cold and need to be taken indoors. Pets that begin to limp or show lameness or other problems should also be taken indoors right away to take care of any injuries or other problems before they are exacerbated by the cold. In general, when a human pet owner is getting uncomfortable outside, it is fair to say the pet is also uncomfortable and it is time to go inside. Remember, you may be wearing multiple layers of cold weather gear and insulated clothes, but your pet is only protected by its own body and fur coat, which may not be adapted to the harshness of the winter conditions. Short walks and play periods can be suitable, but once your pet is getting cold, it's time to head indoors and enjoy some warmer fun.